Marvel’s Cloak & Dagger addresses the ghosts of the past as the 8 year anniversary of the oil rig explosion comes around. To say the explosion was a pivotal event in the lives of the main characters of this show would be an understatement. It meant that Tandy and Tyrone both lost someone very close to them and became connected in ways that they don’t fully understand. This season has very much been about exploring the impact of the event on them as people but this is the first time the sense of loss has been explored in a more direct sense. How to mark the occasion is something Tyrone and Tandy wonder about. Tyrone’s parents don’t really want to do anything which upsets Tyrone because he always feels that his brother should be honoured in some way in case he’s forgotten. His father ends up honouring Billy in a more abstract sense by inviting members of the Mardi Gras tribe around to work on their cloaks. Otis is seen in tears as he holds onto Billy’s old cloak. This shows that Otis always honours the memory of the son he lost even if he doesn’t make an occasion of it. 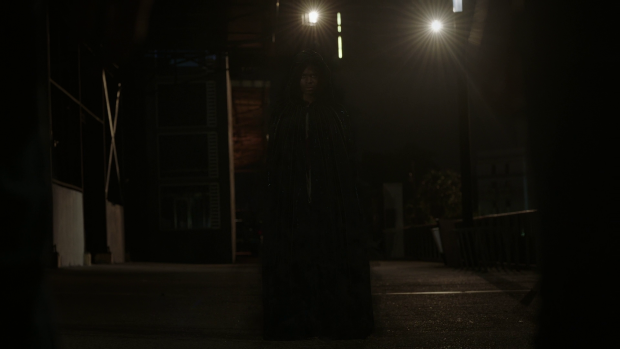 Billy’s cloak is a tangible representation of loss, the past and family so Otis may see the recognition of that as remembering him while also trying to move on with his life. Tyrone’s mother, Adina is very much about moving on with her life and getting through the difficult day that reminds her of what she has lost. The episode doesn’t really dig into her feelings on the matter though her dismissive approach says a lot about how deeply she doesn’t want to go into it. It could be denial on her part or the only way she can cope with what she has experienced and move on with her life. Tyrone’s feelings are in direct contrast to this as he feels they should commemorate the day somehow which suggests that he is unable to move on in a healthy way. I really liked the way the episode explored how Tyrone and his parents react to this as it makes them feel like real people with their own way of dealing with things. Flashbacks add a little more to Billy and Tyrone’s relationship. The idea of this was a lot better than the execution as the conversation about Tyrone growing up to be better than Billy was horribly contrived and predictable. Still, there is something of a romanticism attached to the flashbacks that might compensate for some of this. Billy is seen through Tyrone’s eyes and it’s clear that he looks up to his brother so would possibly remember him slightly incorrectly. Cheesy over the top statements might by Tyrone’s interpretation of an 8 year old memory though it still doesn’t entirely work on screen. A big part of the reason Tyrone is unable to move on is that he is in need of Closure. It’s appropriate that the episode is called “Ghost Stories” because he comes across like a restless spirit with unfinished business. Connors is someone that needs to be brought to justice and it comes across as if Tyrone won’t be able to move on until that happens. Fortunately he takes action on that in this episode by making use of the anniversary and coming up with a plan to haunt Connors by using his powers to convince him that he is the ghost of Billy. On the surface it’s a fairly silly idea but it’s executed so well that it just works. Aubrey Joseph does a brilliant job being quietly terrifying and the way Tyrone engineers the scenario to scare Connors into confessing is excellent. I loved the way the pursuit was shot with a distinct handheld quality from the perspective of Connors who was terrified by the situation he didn’t understand. His fear that he was losing his mind by having his gun taken only to be back where he left it seconds later was great too as it shows how he tries to rationalise what he is experiencing. This plot ends with Connors confessing and being arrested for what he did. It all seems really positive as a dark chapter in Tyrone’s life can be put behind him now and can look into thinking about his own future. To my mind this was the best possible ending to that conflict as it culminates in a confrontation between Tyrone and Connors where Tyrone is able to hear about the events from Connor’s perspective while directly making him answer for what he did. It makes for great and appropriate drama with excellent pay off for both characters. Tyrone gets to defeat the man who caused his family so much pain without crossing the line into killing him and Connors is finally punished for a life time of being immoral. There is a strong suggestion that Connors has friends in high places. O’Reilly and Fuchs are seen gloating over their victory over the corruption within the police department and is met with a threatening glance from Connors. Shortly after that Fuchs ends up dead, bloody and stuffed in the fridge which makes for a really distressing image pointing to a much larger association for Connors that will likely form the basis for the conflict in the remaining two episodes. My thinking is that Connors is somehow connected to Roxxon and they are taking steps to silence anyone who knows too much. Fuchs’ body being stuffed in a fridge serves as a warning to O’Reilly to leave well enough alone but based on what we know about her there is no chance she will let this go. This is backed up by the exploration of the relationship between Fuchs and O’Reilly. They have been seen sleeping together before this point but this episode shows them having a romantic breakfast and applying the “girlfriend” label which in retrospect seals Fuchs fate as the abundance of happiness could only really end in tragedy for them. It’s somewhat predictable and was obvious from the moment Connors glared at O’Reilly but it’s handled well enough thanks to time devoted to making this relationship stand out as being interesting so it feels like something important has been lost now that Fuchs is dead. Building characters that an audience can invest in is one of the major strengths of this show and this episode offers an excellent example of that with the shock attached to O’Reilly’s discovery. This allows for a really good exploration of Tandy’s complicated morality. Initially bringing Scarborough to justice and letting the truth be known is about doing the right thing for her family as well as Tyrone and Mina’s. It’s important to her that this doesn’t get swept under the rug and Roxxon be allowed to continue exploiting people for profit. There’s even a lot of strong work put into Tandy and Melissa’s relationship as they agree to honour Nathan by sending up a lantern to commemorate the occasion. Having them go through Nathan’s belongings, talk about him and generally enjoy being close to one another is a great bonding moment for these two characters who are slowly repairing their relationship after years of being apart from one another. The flashbacks tell us a lot about their relationship. After losing her father Tandy has to find her own way home which shows the beginnings of the skills she has perfected over the years. She is shown stealing a phone because that’s what she needs to survive at that point and is able to remain calm enough to find her way home. When she gets there she finds her mother passed out with booze and pills nearby causing her to call for help. It’s an extreme image and shows the beginnings of the rift that exists between them and Tandy’s mindset that she can only count on herself. There is also development on the reluctant friendship that is growing between Tandy and Tyrone when she visits him at home with the apparent goal of offering support to him on such an important day for both of them. It turns out that she is after Adina’s ID badge to sneak into Roxxon but it’s also clear that she’s in pain and reaching out to the only person who truly understands what she’s going through as a result of their connection. Inviting him to the lantern ceremony she shares with her mother is a clear indication of how genuine she is in offering comfort and support though I like that her actions have an agenda behind them as it’s a big part of who Tandy is. During the ceremony Tandy and Tyrone end up experiencing one of Melissa’s memories. At first it seems innocuous enough with Nathan hard at work and Melissa happily coming up to him offering him a drink and a break from focusing on works. It’s a romantic image and a representation of Tandy watching it on a cinema screen as she looks on happily shows clearly that she has chosen to remember her family life in that idyllic way. It isn’t until she literally scratches the surface and goes into the memory that the dark truth is revealed. After Melissa accidentally spills her drink on Nathan’s work he hits her which is played to be a big shock to Tandy, Tyrone and the audience. It’s unclear if this is something she knew about and purposely ignored or if she’s learning this for the first time. Either way it shatters the fantasy of the great man her father was and the perfect family life that she once had. After learning this she takes the money from Scarborough because she no longer feels that Nathan Bowen deserves that justice after the way he treated her mother. She will likely learn that the situation was more complicated than that because perspective is one of the things this show is interested in exploring but her reaction to what she learns makes sense as it’s clear that she has been deeply hurt by a truth that she either ignored or was unaware of. Not what you want to come home to! An excellent episode that handles the anniversary of the rig explosion really well. Tyrone being at odds with his parents who don’t really want to commemorate it where he feels that it’s an occasion that they have to observe. Adina seems to want to move on with her life because the day represents a profound loss, Otis honours Billy by having the Mardi Gras tribe over and remembering him through his cloak where Tyrone really needs closure in the form of bringing Connors to justice. This results in a great sequence where Tyrone uses his powers to haunt Connors to force him to confess and turn himself in. Tyrone is able to look Connors in the eye and get him to admit what he did which makes for an important step forward. Unfortunately this is bad news for O’Reilly who finds Fuchs killed after a sinister glare from Connors indicating that he’s more connected than it might initially appear. The episode does a great job establishing O’Reilly and Fuchs’ relationship as something worth investing in. Tandy goes about interrogating Scarborough to make him aware that she has enough evidence to bring him down. It seems important to her for him to know that he’s beaten. He offers her an obscene amount of money to back down and she initially declines out of a desire to do right by her, Mina and Tyrone’s families but changes her mind after learning that the romanticised image of her father has a dark truth behind it. She takes the money instead and this sets up her gaining more context to go along with this reveal. Flashbacks allow the audience to see the beginnings of her self reliance when she steals a phone and remains calm as she finds her way home. The fact that her mother is passed out after drinking and taking pills shows the start of the rift between them as Tandy realises that she can only count on herself for survival.